Princess V72 "NESL" yacht is offered for sale with EU VAT (Malta) paid, was always taken care of by professional crew and available for a visit in Spain any day! Designed by Bernard Olesinski, Princess V72 yacht was first introduced to the market in 2012. With the powerful CAT C-32 ACERT diesel engines (1.622 hp each. 1374 hours) boat can easily reach max. 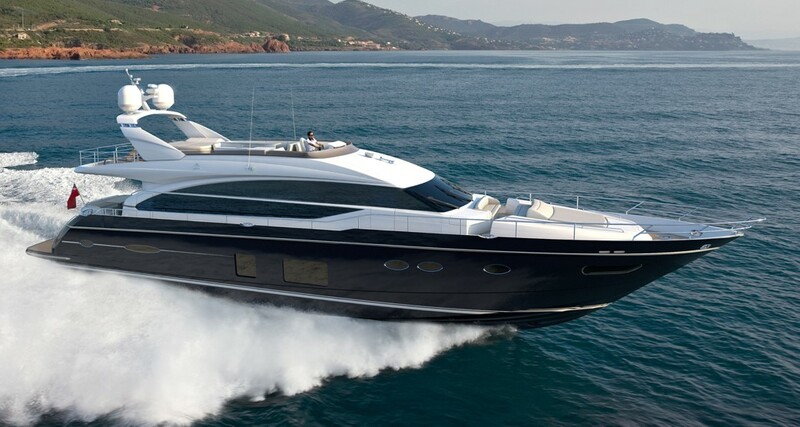 37 knots, while practical layout accommodates 6 guests in 3 cabins + 2 crew aft. This graceful sports yacht, with its impressive size, is distinguished by a light hull, which is very positive at maximum speed - the weight saving of several tons (compared to competitors) allows Princess V72 to accelerate to almost 40 knots, leaving the latter behind. A wide hatch in hardtop, along with three light "windows" complements the panoramic windows of the superstructure, and passengers are able to sail with the breeze not only on the beach in the spacious aft cockpit, but even without leaving the cabin. In addition to the three luxury guest suites, the Princess V72 has a double crew cabin with a separate entrance through the door in the transom next to the spacious garage. SYS Yacht Sales is pleased to assist you in the purchase of this vessel. This boat is centrally listed by MZ Yachts.